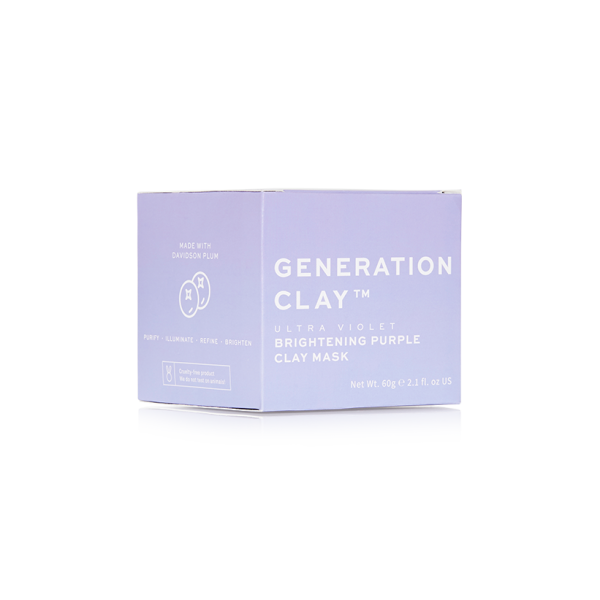 Perfectly on point in a shade of Pantone’s Colour of the Year’s Ultra Violet, our Generation ClayTM Ultra Violet Brightening Purple Clay Mask is packed with locally sourced superfruit, Davidson plum. A gentle, natural version of skin-exfoliating alpha-hydroxy acid (AHA), the hardworking beauty hero rejuvenates dull, tired skin while lightening dark circles and pigmentation. For added benefits, we’ve pumped this mask with witch hazel to extract excess oil, vitamin E, an antioxidant that protects against free radicals, and desert lime, a thorny Australian citrus fruit that boosts hydration, assists with the absorption of antioxidants and increases collagen production.